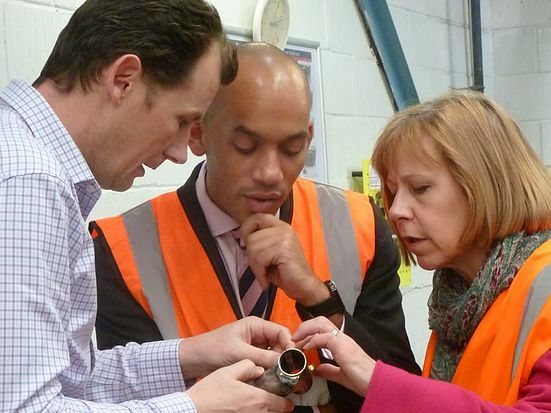 In the run-up to the General Election on 7 May, Chuka Umunna MP is visiting workplaces across the country to talk with employees and business leaders, entrepreneurs and local people about how we can take Britain’s economy forward and create more high-skilled, high-paid jobs of the future. Chuka and I toured the premises and talked with the designers and makers of the world-famous Brompton Bicycles to discuss what Labour’s jobs plan means for London, supporting more high-skilled, better paid jobs. Brompton Bicycle is a local West London success story on a global scale. The unique Brompton folding bike was designed and built in London in 1975 by Andrew Ritchie in his flat in South Kensington opposite the Brompton Oratory. Starting production in a railway arch just off the High Street, the bikes are still made in Brentford today and Brompton has become the UK’s largest bike manufacturer, making over 40,000 bikes per year. Over 80% of sales are in international markets and Brompton Bicycle has in recent years opened up 8 flagship retail stores in key cities around the world, including a London store in Covent Garden. "As the election campaign begins, we are focusing on the high-skilled, better paid jobs which Labour's plan will support. "It was fantastic to visit Brompton Bicycle with Ruth Cadbury. We need to see even more firms like Brompton: exporting overseas, creating high-skilled jobs and exemplifying the best of British innovation and ingenuity." Brompton is a company that works. They invest in people and training to create a high quality product that’s sold all over the world. As a Brentford Councillor I’ve watched the company go from strength to strength to become a company that local people can be proud of. I want to thank their CEO, Will Butler-Adams, Nick Charlier, and the entire Brompton team for the visit. Give Power to local people: devolve powers and budgets to combined authorities and LEPs to ensure growth in every part of the country. Labour will work constructively with our European partners to focus on growth, not push Britain towards the EU exit door which would risk vital investment and jobs. There are 2,260 businesses exporting to EU countries in the London region.